Three vehicles were set on fire overnight near a mosque in the village of Umm al-Qutuf in Wadi Ara and graffiti was sprayed on the wall of the mosque, reading "price-tag" alongside a Star of David and "Eviatar," most likely referring to Eviatar Borovsky, who was stabbed to death in the Tapuach Junction some two weeks ago. Police forces at the scene reported to have launched an investigation into the circumstances, "including nationalistic motives," a police source told Ynet. Ali Kabha, chairman of the Umm al-Qutuf committee said: "We are certain that Jews were the ones who did it. This is the first time a nationalistically-motivated incident occurs in our village. We urge the police to find the offenders and punish them." Ilan Sadeh, head of the Menashe Regional Council, in the jurisdiction of which the village is located, condemned the offense, adding that he would not allow such incidents to "hinder the unique ties between the council's Jews and Arabs." Ahmed Kabha, a resident of Umm al-Qutuf, vowed to "take the proper steps to fight this. The entire Arab sector should protest against those who carry out such acts. Light punishments legitimize further offenses." Earlier Tuesday, the Safed police launched an investigation into the spraying of racist graffiti in the city. One of the graffiti read: "Arabs out." 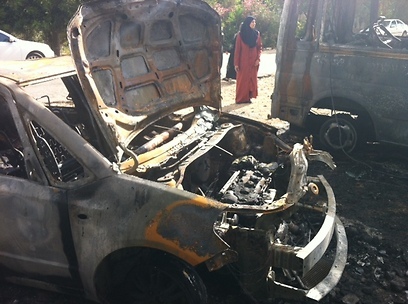 See all talkbacks "Wadi Ara: Mosque desecrated; 3 cars set on fire"